Christmas is coming, the goose is getting fat ! 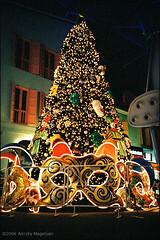 Are you ready for Christmas ? Got all your presents, written your cards, prepared the turkey ? Those who really know me will know that I am far from ready. What`s more I`m finding it hard to be motivated this year towards getting ready. I can`t quite put my finger on why that is either. Perhaps it’s because over the last few weeks we have taken the decision to cease our appointment here in Borders Mission Circuit and that’s somewhat distracted me. It was rather comical to attend a District event a few weeks ago and discover that for the full 24 hours there were only two items of conversation, or so it seemed, that of women Bishops and “why was Mike Redshaw leaving Borders Mission Circuit”. It’s a long time since I`ve been that much the centre of speculation. Maybe it’s because I`ve been involved in the stationing process to find a new home to go to. Subject to the whim of Methodist Conference Alison and I should be settling ourselves into a brand new, newly-formed, Circuit called Trent and Dove next Summer. This is an amalgamation of the Burton upon Trent and the Dove Valley Circuits. 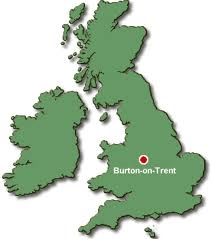 We will be living in Burton upon Trent but the area will extend out to Uttoxeter. Perhaps I`ve been preoccupied with that. Maybe it’s because I`ve been worried about what would happen here in Borders Mission Circuit that I`ve failed to see how quickly Christmas is coming. Thankfully that search is over and a new Presbyter has been appointed so I can now relax about that, I hope ! I suspect that my apathy towards Christmas this year has been caught up with all of the above, combined with unseasonal weather, the disappointment that neither Dad nor Alisons` Mum will be visiting us at Christmas, and a general air of weariness. However our Christmas tree went up last night, tomorrow I`m at a local garden centre as one of Santa’s helpers (with my Rotary Club) and next week begins the countdown towards the day itself. Maybe I`ll start to feel Christmassy as the days go by; I hope so……..
Why is it important though to get into the spirit of Christmas ? To many of us its become an overcommercialised excuse for drinking and overspending. I was horrified to discover today that the average child in this country will receive something like £450 worth of goods, many electronic, on the day itself.Indeed a school has urged the youngsters to go home and ask for an iPad for Christmas so that work can be downloaded direct onto it; surely this could push some parents further into poverty ? Well, I think that Christians need to show the true meaning of Christmas; the love that came down from Heaven in Jesus, the sharing, the hope that He brings, the peace between nations. The commercial side of the festivities do not improve the lives of people at all (if anything it creates false hope by anaesthetising the current recessional difficulties), but Jesus does improve us. The hope He gives us gives a purpose and direction to our lives, the peace that only He can bring delivers a sense of our lives being cared for, and the love that lies at the heart of Heaven is brought into our hearts reminding us that no matter what is going on in the world WE ARE LOVED ! 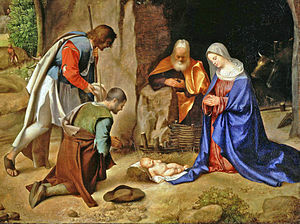 I hope and pray that as these last few days lead us towards the 25th December we will find that in reality we are being led towards the stable in Bethlehem, so that we like the wise men, the shepherds and countless others over the ages can bow the knee and praise the God who has entered our world with the precious gift of Jesus Christ.